I’m not trying to wage war against the residents of Queens, but I’m going to say something they’re not going to like. Don’t get all offended, it is just fact. 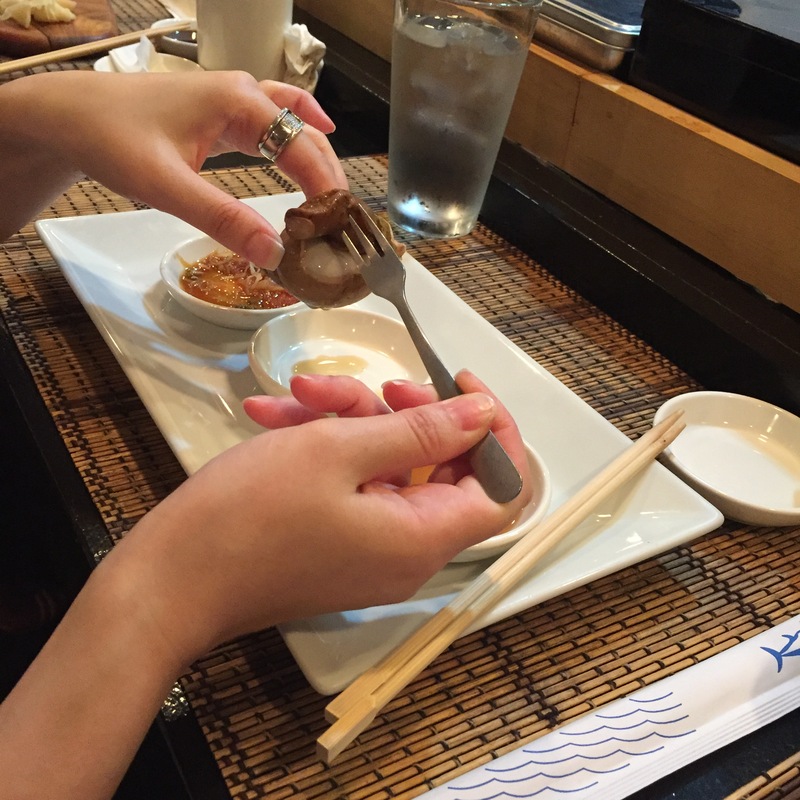 Fact is, there is a shortage of GOOD sushi yas in Queens. That’s fact. In my books, until today, there was a total of two. Yes, TWO. 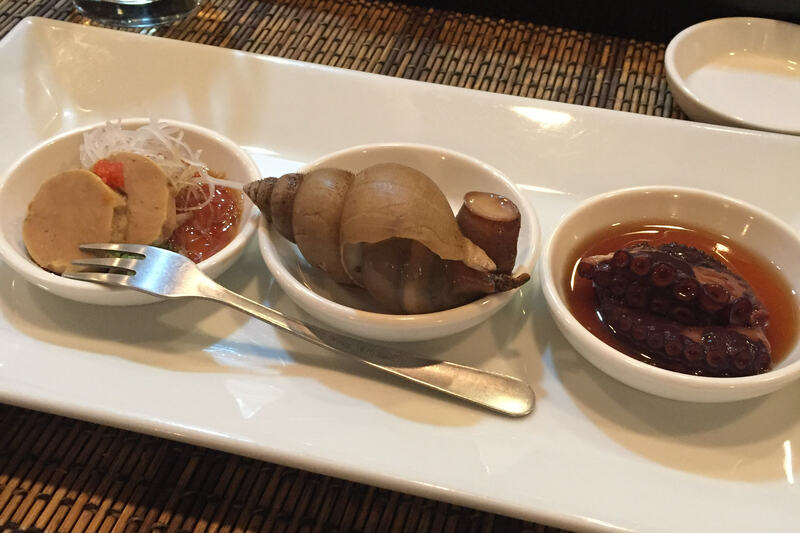 IKI CUISINE and SUSHI DAIZEN. Today, I’m adding a third, Ginpachi. 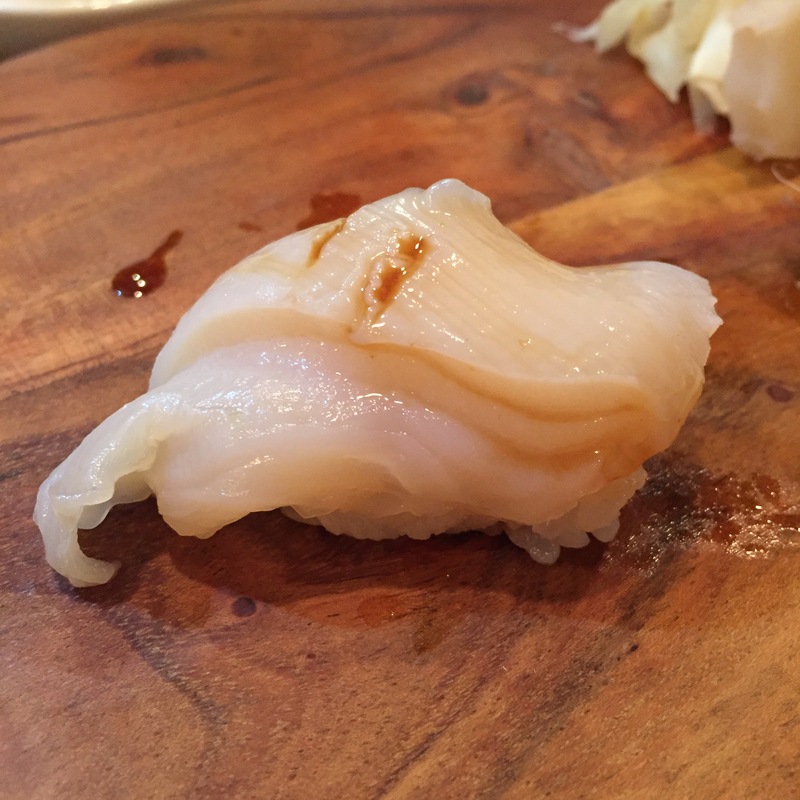 A non-fancy, no frills, neighborhood sushi ya that has decent variety, and good serving skills. I go to Queens regularly so I PATROL food blogs on what else is there. Trust me, there’s nothing. 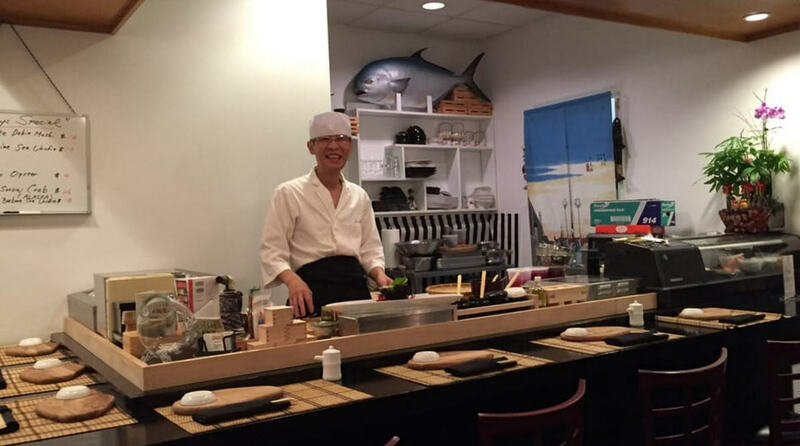 Satoshi-san comes from BLUE RIBBON SUSHI in NYC. He left Blue Ribbon to open his own place in Bayside. While I’m not a HUGE fan of Blue Ribbon Sushi, and definitely not for their omakase, they do always have fresh fish, and good variety. Sourcing/supply is 9/10 of the game! Admittedly I am a sushi snob and a half. But I’m also very appreciative of my surroundings. I always understand where I am, and I appreciate it for what it is. I have sushi everywhere I go. Everywhere. Do I expect there to be good sushi in Disney World? Atlanta? Nashville? Pennsylvania? No. But if that’s where I’m at, I reset my expectations, and I know what quality and variety of fish I will be receiving. It’s not me being presumptuous, me acting like I know more than I do, it’s a simple matter of supply and demand. Does your clientele demand that quality or variety? If not, why would you as a restaurant establishment, bother stocking the supply? You’re better off just fancifying your rolls. Yes, I recognize fancify is not a word, but my blog, my rules. You throw a million things into a roll, make it real pretty, slap some ridiculous name, and that’s what your customers come in for. 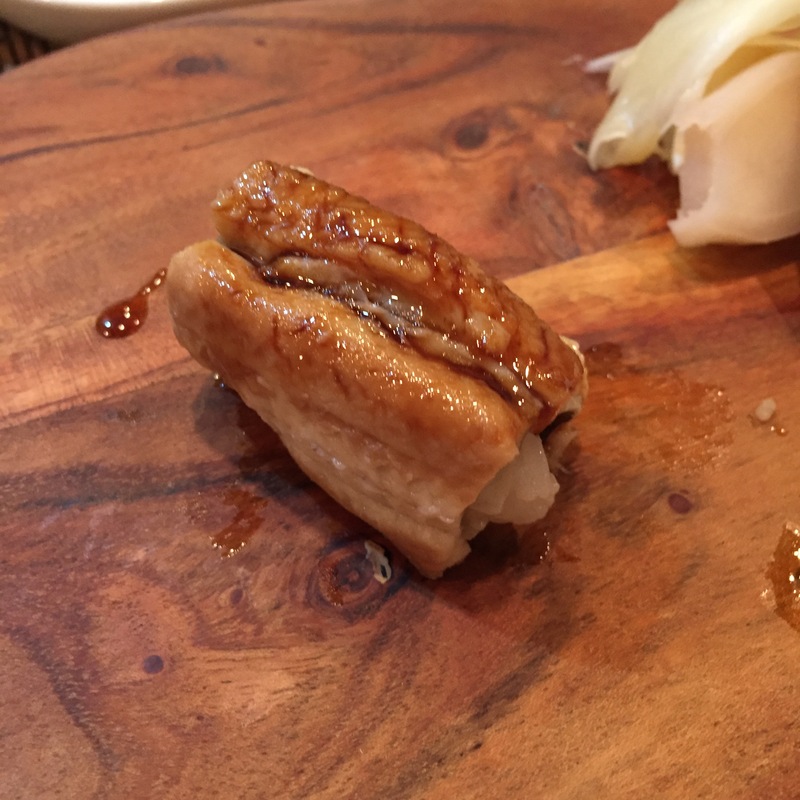 Dude – I love a good roll, so I too, will visit, and I too, will order them. BUT that’s a dime a dozen, and NOT what makes a good sushi ya. What makes a good sushi ya (according to yours truly), are the rating categories you find on my blog, variety, freshness, and preparation. And if the costs are somewhat affordable, all the better! 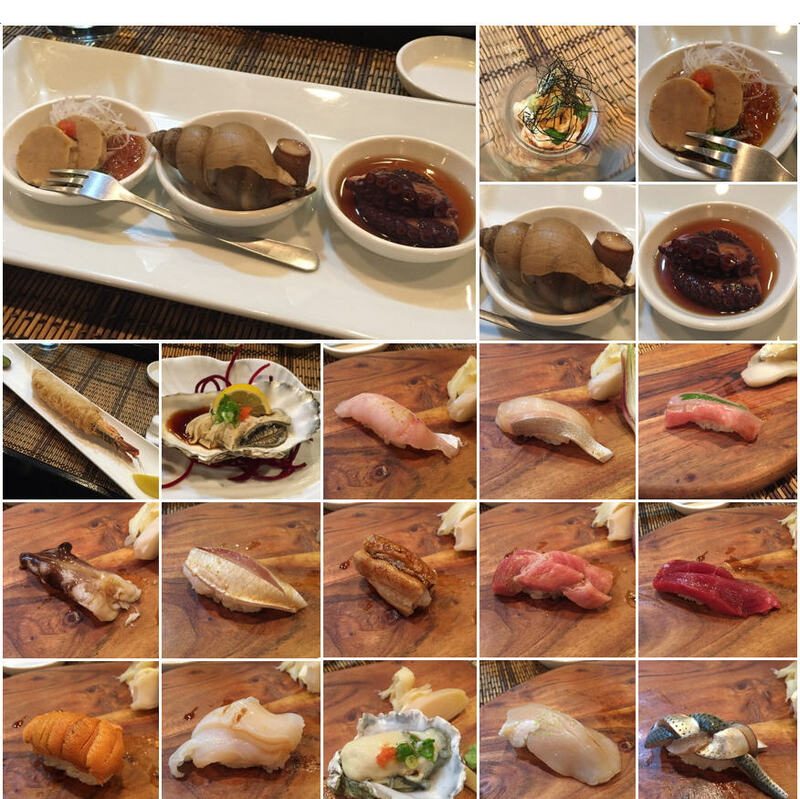 The Omakase offered $65 – This consist of several OTOSHIs (starters), and 6 pieces of sushi. The hidden/non talked abt Sushi Only Omakase $??? – What the large party of 7 ordered, but I did not realize that was an option!!! 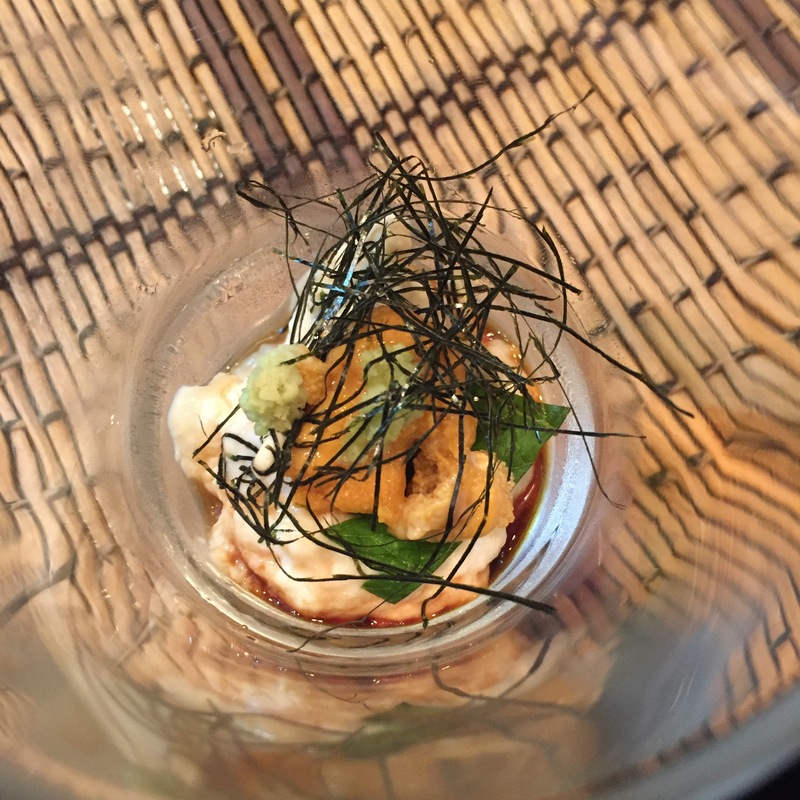 UNI with Tofu Skin, YUBA, shredded NORI, and SHISO – Reminds me of KYO YA. This one was very good! 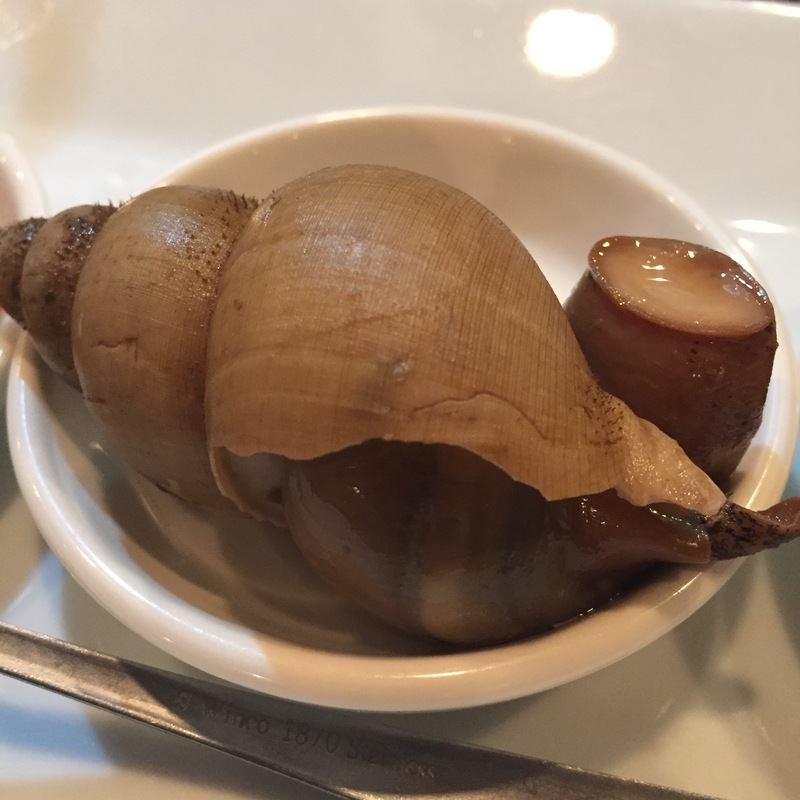 BAIGAI (small Japanese snail) – Slow poached to a nice chewy but not overly so, consistency. The flavors were spectacular. 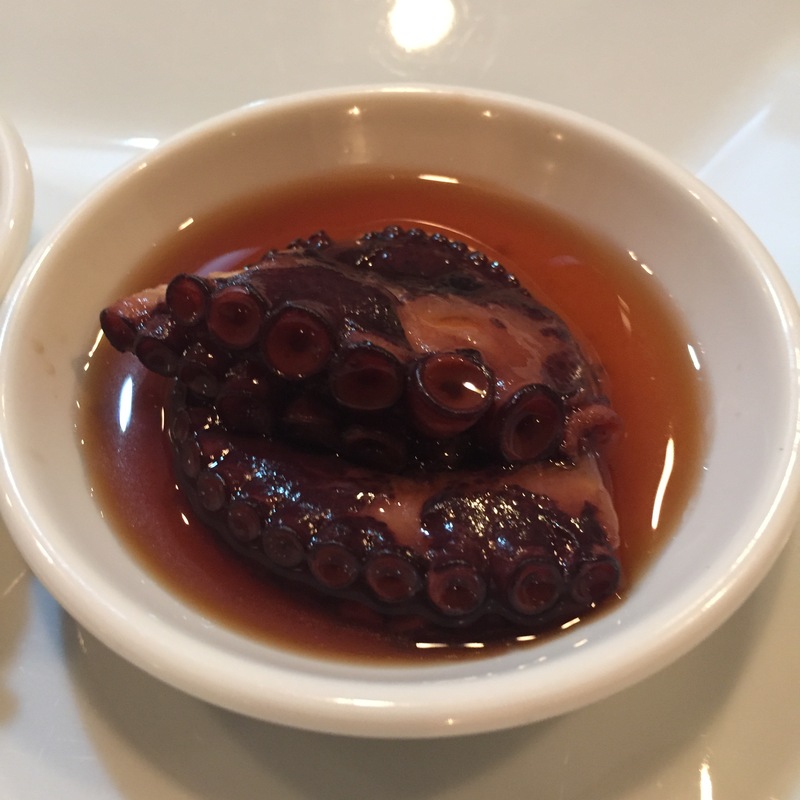 TAKO (Octopus) – Slow poached TAKO, served in a nice thick DASHI. YUM! This reminds me of 15 East. But they have more flavoring, while 15 East is more focused on just the fish. 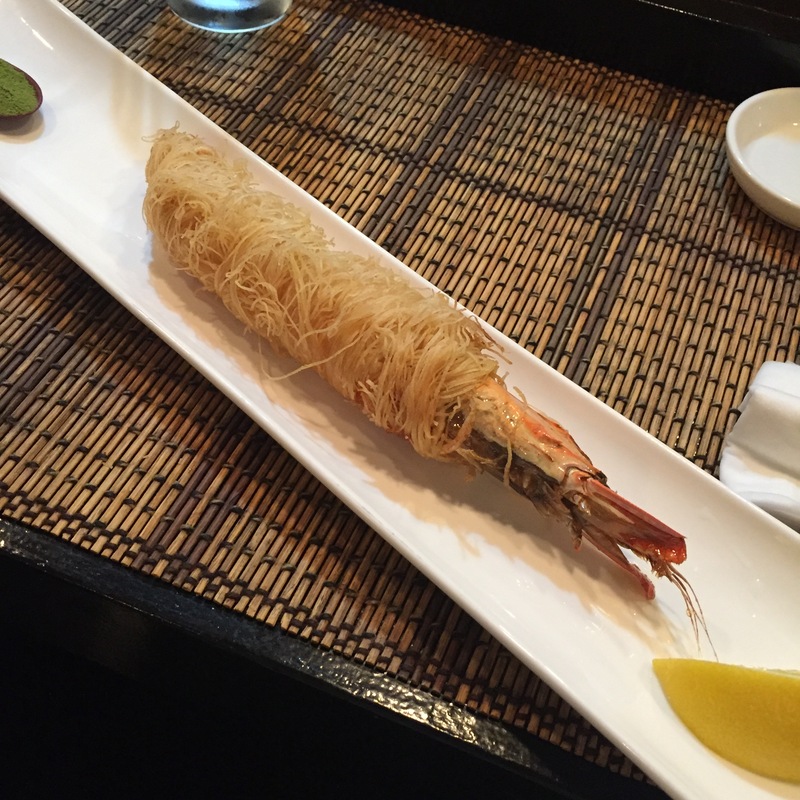 Large shrimp fried in a noodle – You can’t tell from this photo, but this thing was ginormous. It was larger than your average hot dog. More like a Keilbasa! Ok, maybe not that big… Though a bit much, the noodles were super crunchy, the flavors were good, the green tea salt was very good. All in all, very happy, but we really didn’t need this much. Giant west oyster – Generally not a huge fan of huge oysters, I’m that odd individual that likes the smaller oysters (small, not thin, not waify, not watery, just small). This was good, but not great. AKAMUTSU (Rosy Sea Bass) – Served with a little bit of shaved YUZU (Japanese citrus) and topped with a little bit of soy. I’d prefer salt rather than soy with the YUZU, but still very enjoyable, very good. 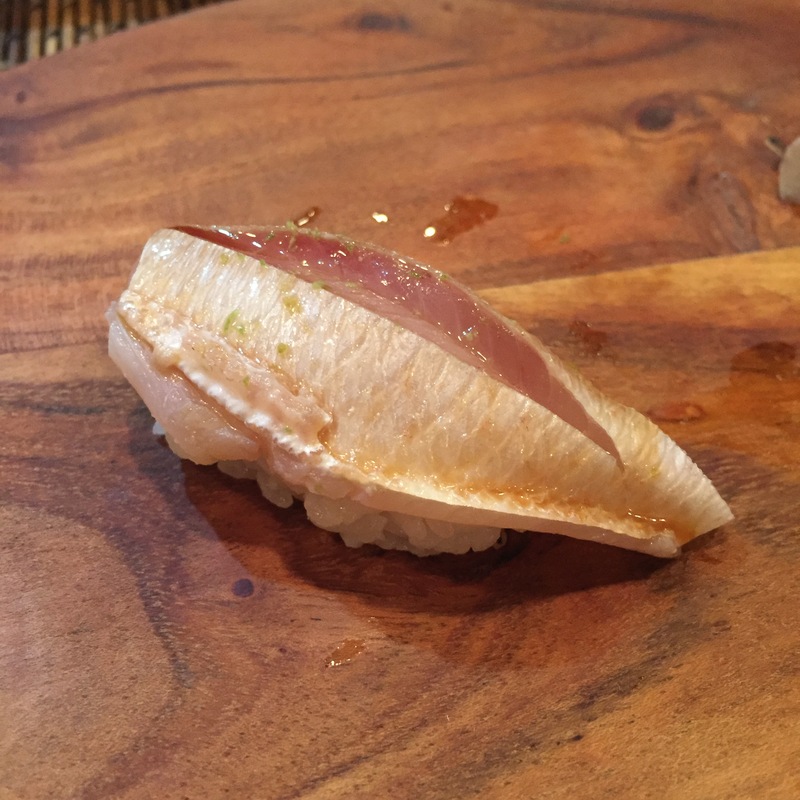 SHIMA AJI (Striped jack fish) – This was a rather fatty cut of SHIMA AJI. Still very good, very fresh, nice texture. 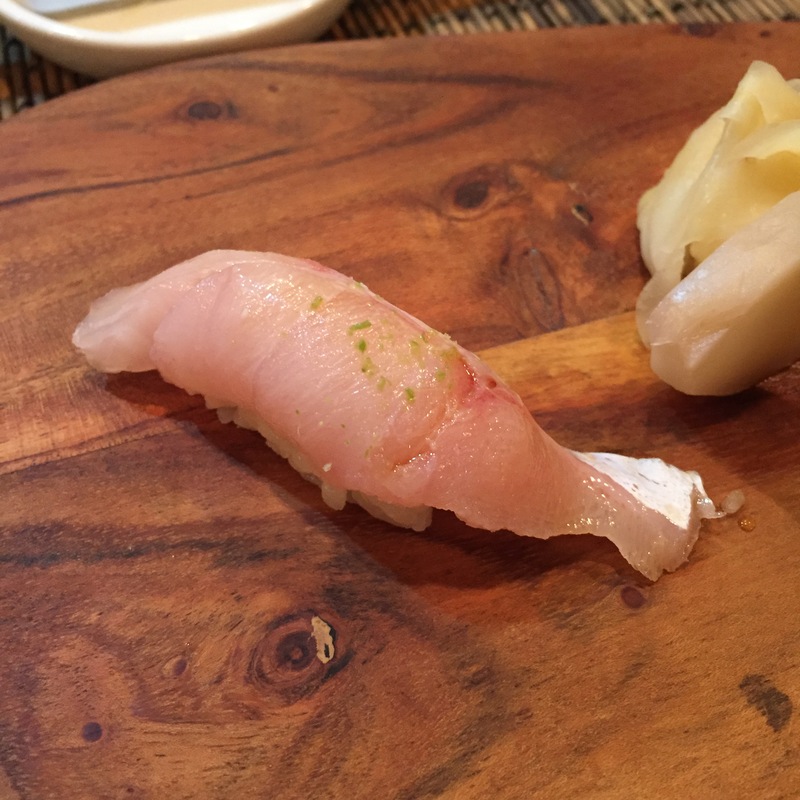 KINMEDAI (Golden eye snapper) with KOMBU (sea kelp) – Ooof. KINMEDAIs are one of my favorite whites, but what’s with the topping? 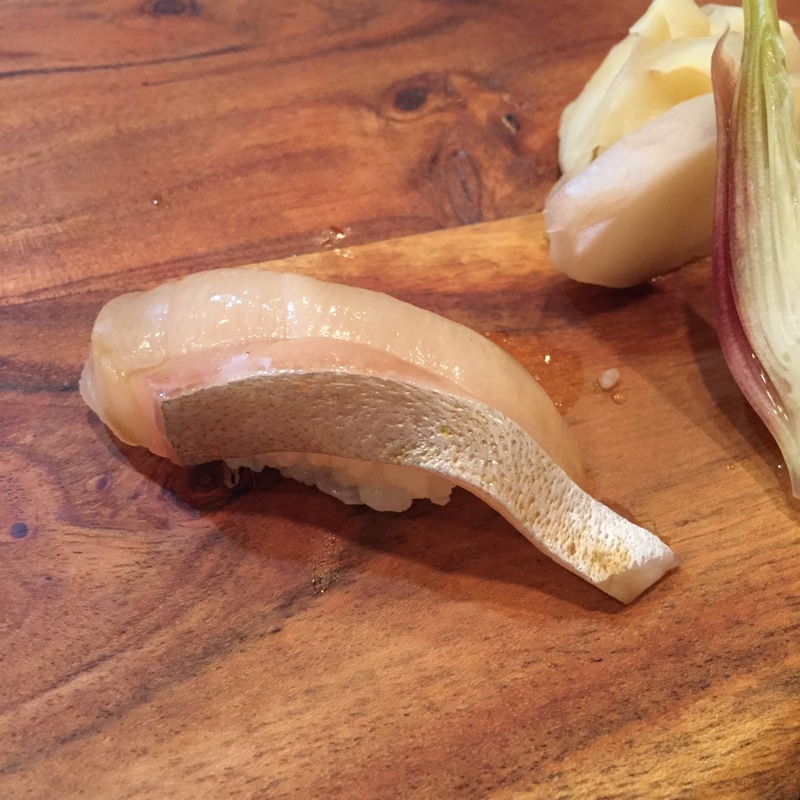 I love KOMBU on a leaner, lighter fish like HIRAME, but not loving it at all on this KINMEDAI. 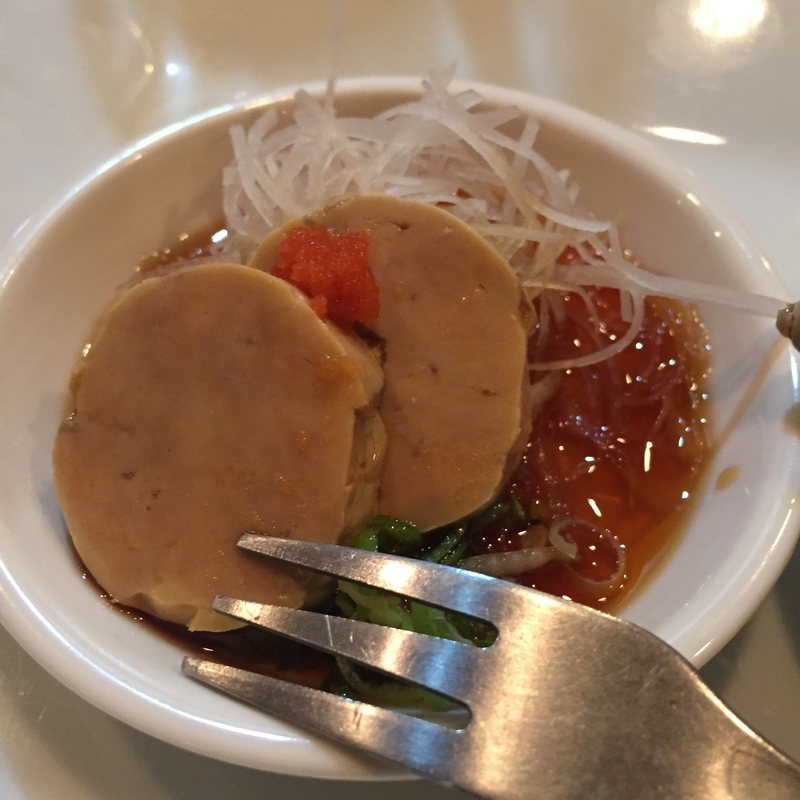 TORIGAI (Beakneck clam) – Not a lover of TORIGAI. 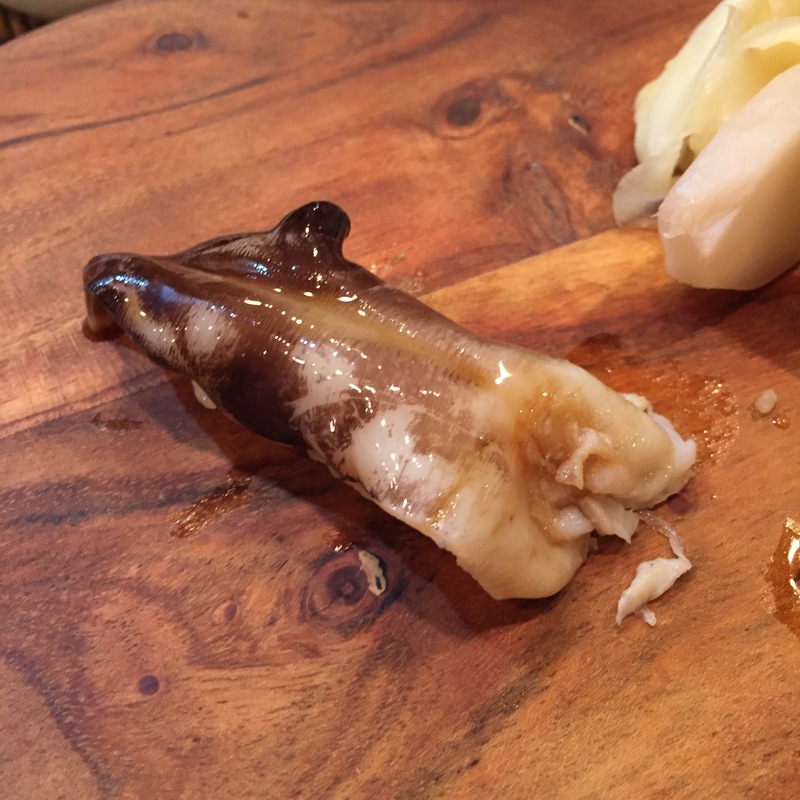 I saw him serve this to our neighbors on the sushi bar, I SHOULD have asked him to pass, but missed my opportunity. This was bland and chewy, as usual. Really don’t know why folks stock this clam. 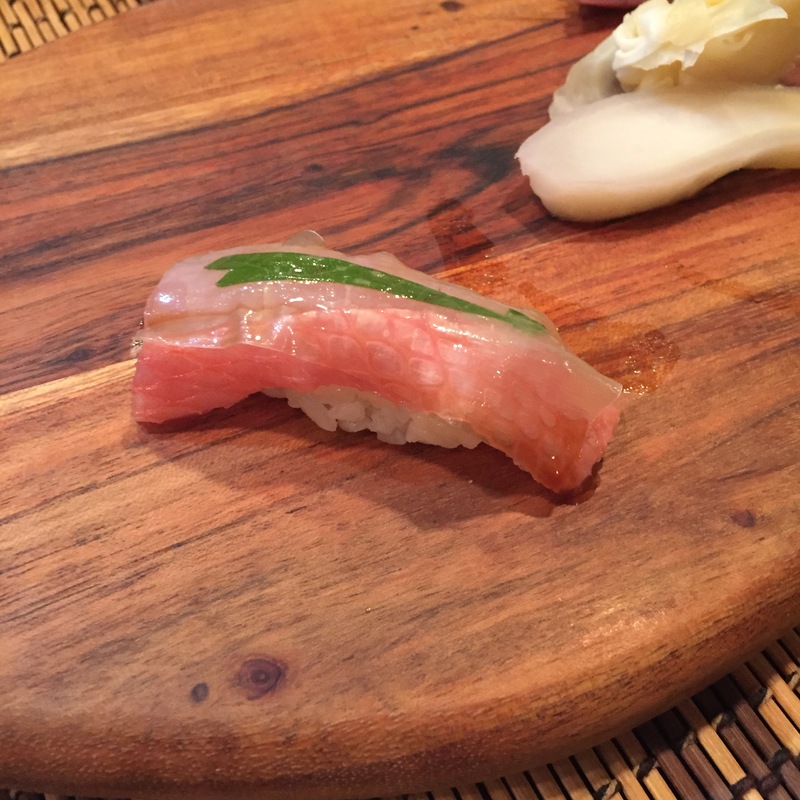 KASUGODAI (Baby sea bream) – This was amaze balls! 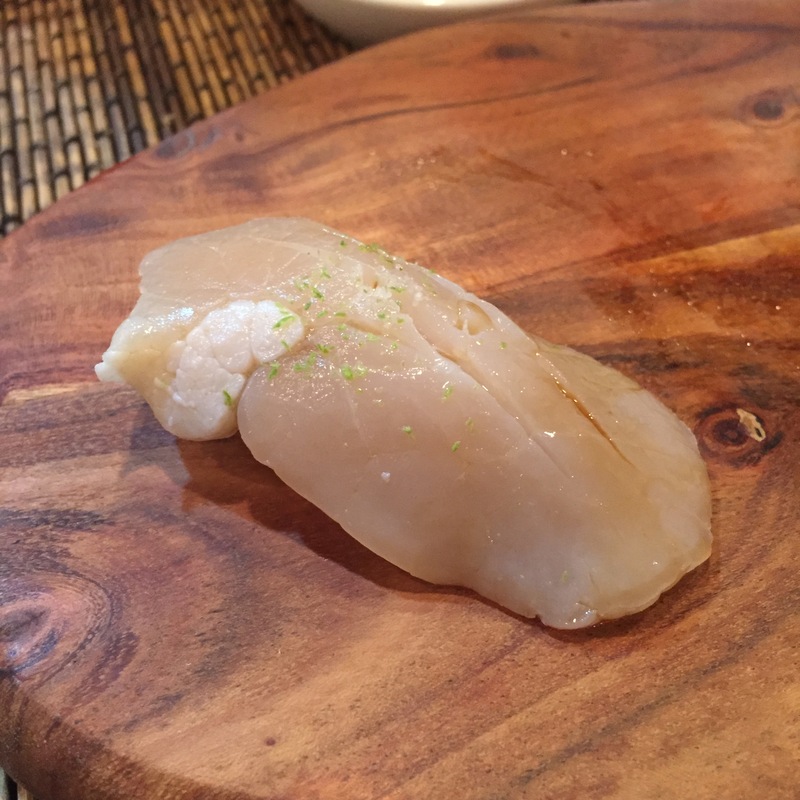 Again, served with shaved YUZU and soy, and again, would prefer it to have been sea salt rather than salt for this super light fish. 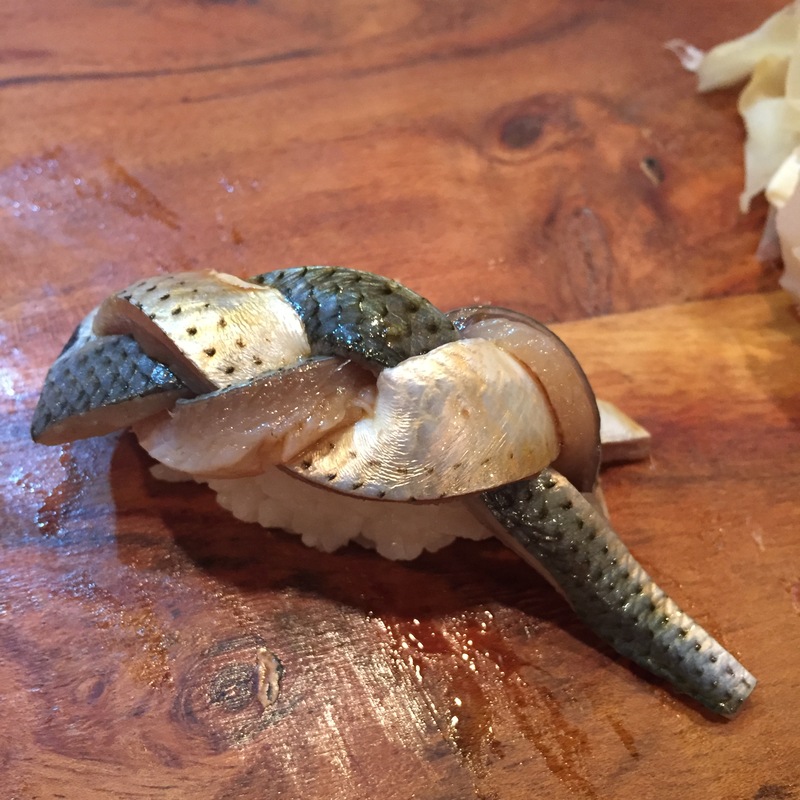 ANAGO (Sea Eel) – No idea, don’t like wasting my stomach space with ANAGOs. I made Kitty Kat eat mine. 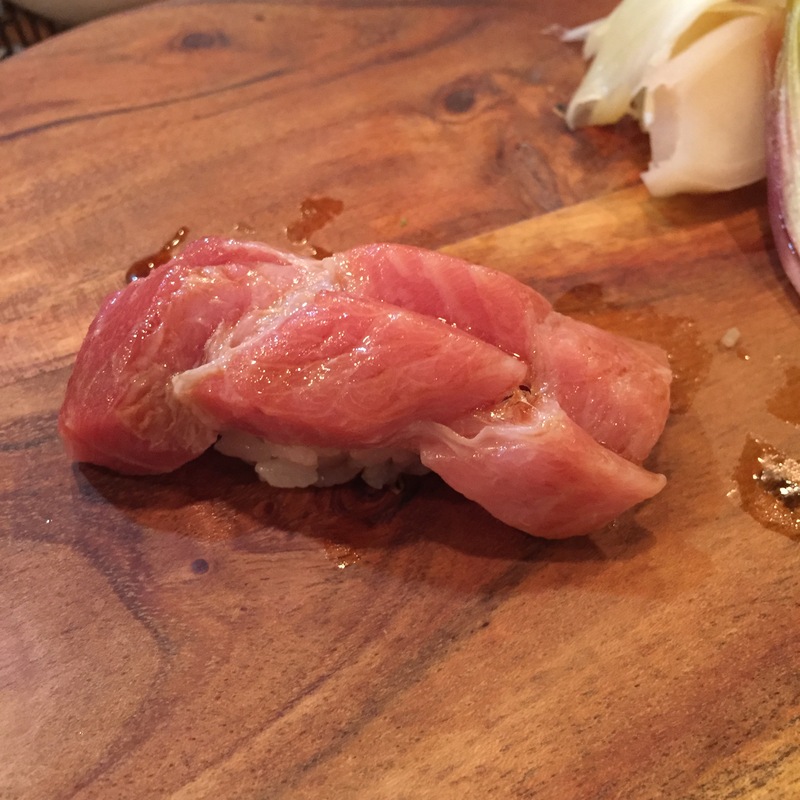 CHUTORO (Medium fatty tuna) – No vein, no chew, no funky aftertaste, and not so overwhelmingly fatty that you are left with a film of grease inside your mouth. This was a GOOD cut. 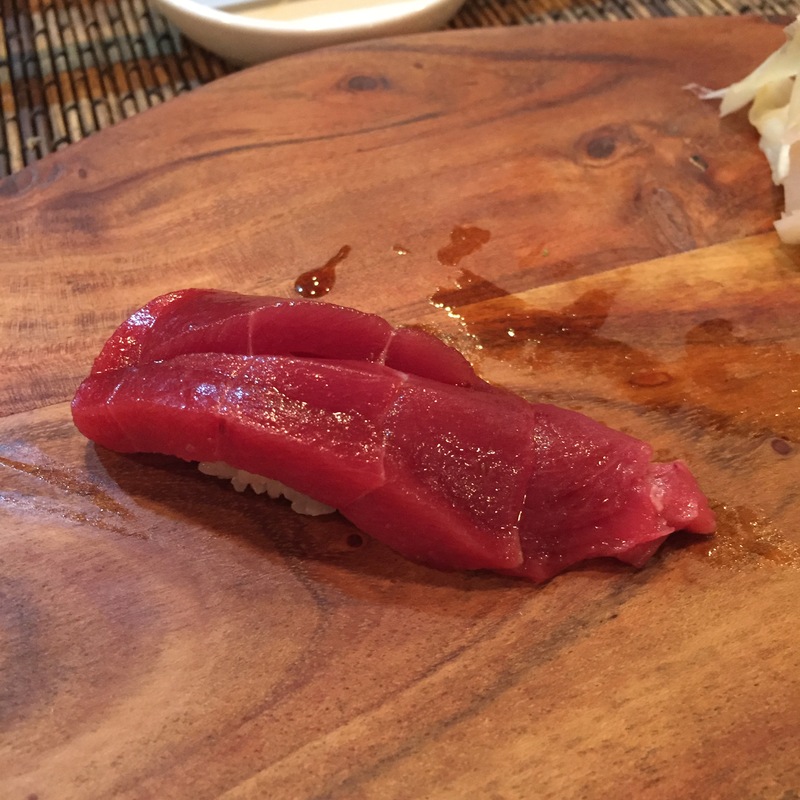 AKAMI ZUKE (Marinated lean blue fin tuna) – Wowzers – VERY GOOD. This was likely my favorite piece of the night, which is rare for a Tuna. I usually lean towards my whites, mollusks and roes. Satoshi-san had some solid whites (the KASUGODAI and AKAMUTSU), but this wins out! YUMMMMMY! 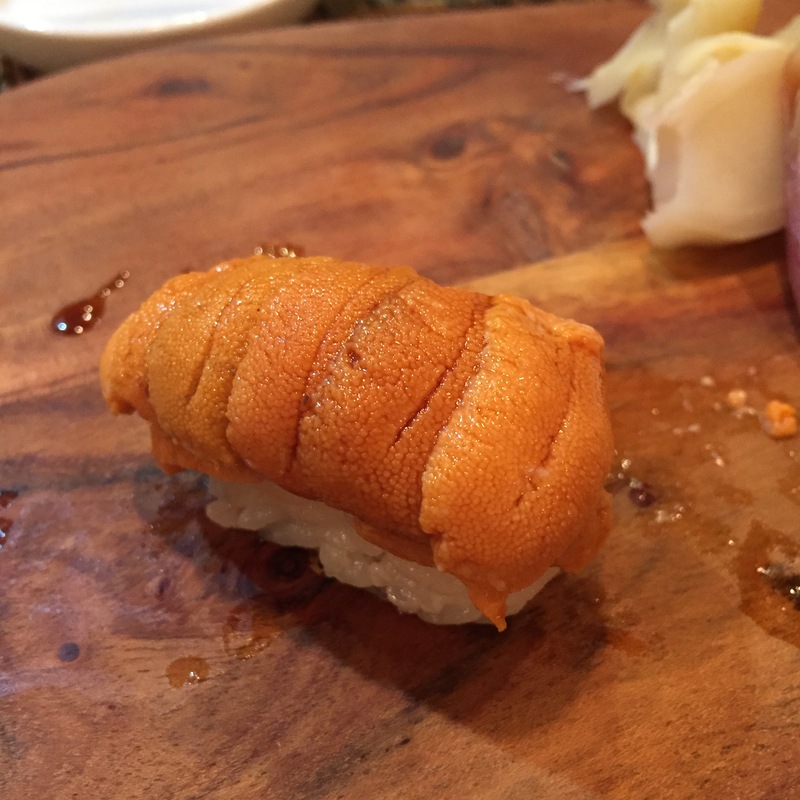 HOKKAIDO UNI – Unusually sweet! For a bad UNI year, this was a good serving! 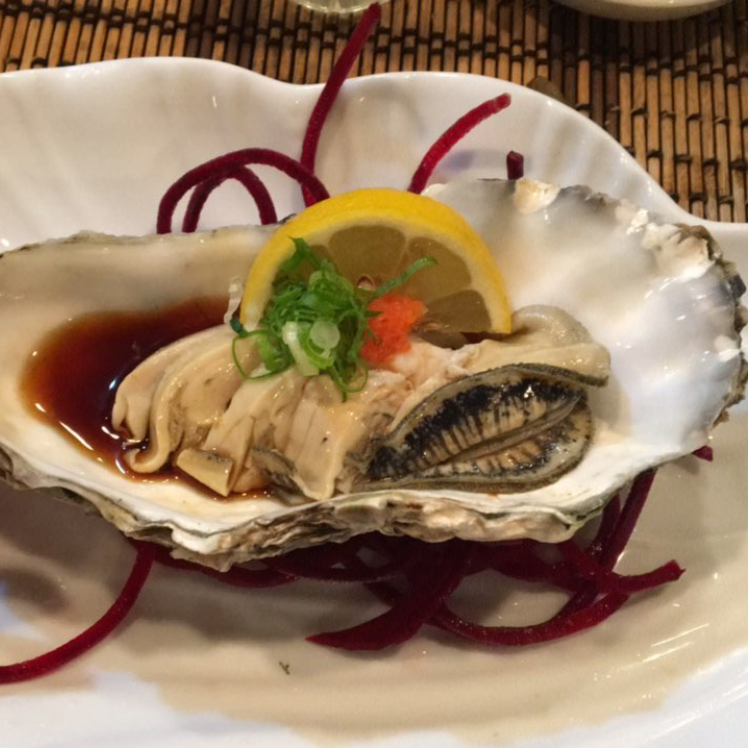 MIRUGAI (Giant clam) – Boyfriend is beyond jealous. MIRUGAIs are his favorite! This was very good, a beautiful crunch, a sweet taste, and no fishiness at all. 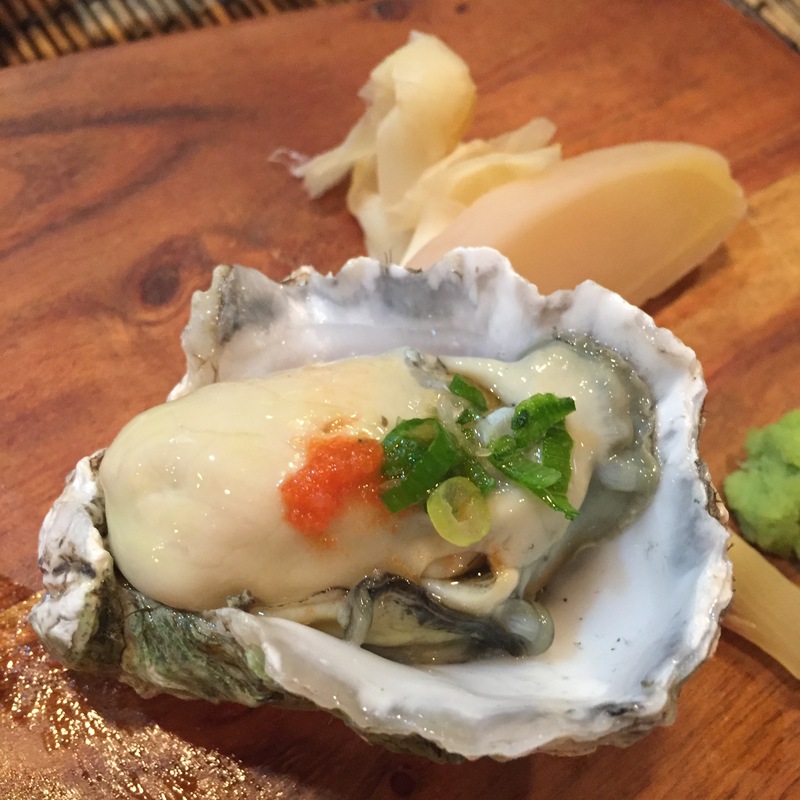 KUMAMOTO Oyster – Served atop a little ball of rice, so a little sushi-like. SOME folks tend to rate how great a restaurant is based on the restaurant’s reds (Tunas) and oranges (salmons/chars/trouts). 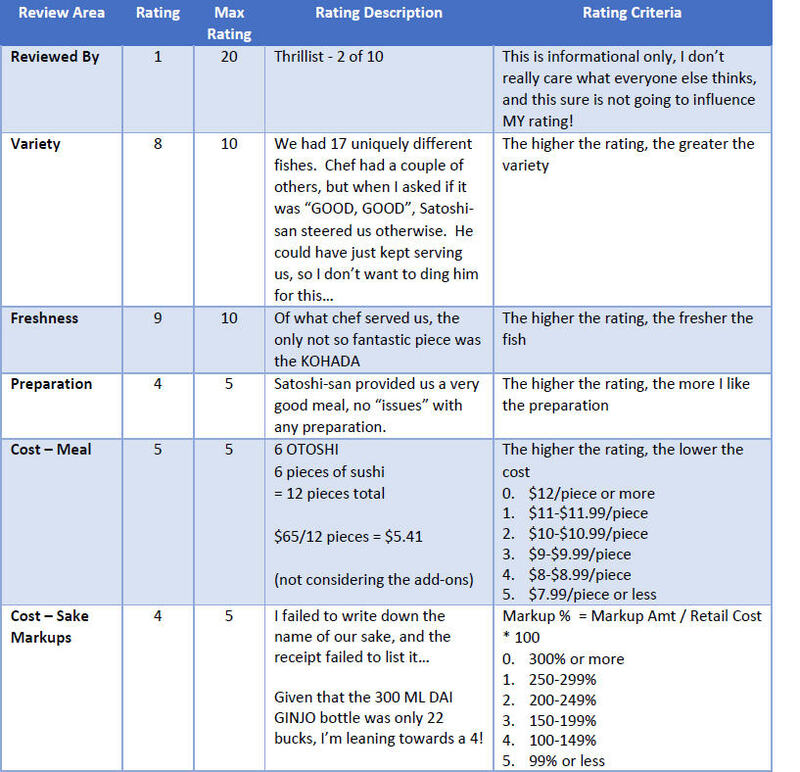 If you were rating GINPACHI based on their Tunas, GINPACHI would rate fairly high. I’m not one of those folks. However, in my opinion is that GINPACHI is a still GREAT neighborhood restaurant, decent enough variety, fun and entertaining chef, and VERY affordable prices.